The East River Park runs alongside the Franklin Delano Roosevelt (FDR) Drive and the East River from Montgomery Street to East 12th Street. It was conceived in the early 1930s when Robert Moses (1888-1981) was designing the FDR (also known as East River) Drive. Moses knew that the expressway would pass through the Lower East Side, a neighborhood sorely in need of parkland. He was determined not to let the land between the expressway and the river go to waste. Moses envisioned a tree-shaded esplanade with abundant recreational facilities and windswept views of the East River and beyond. Moses soon faced a problem: the acquisition of enough land for a park in this densely populated area. To provide more parkland, he built a 10-foot wide concrete extension to Manhattan’s eastern shoreline spanning 20 blocks in length. The combination of the added platform and Moses’s energetic legal wrangling was enough to secure the needed land, and in 1939, East River Park - the Lower East Side’s largest open space - opened alongside the FDR Drive. 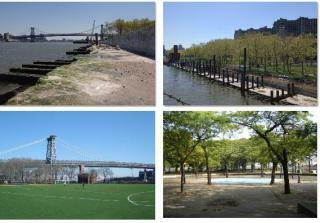 Since then, the East River Park has gone through many changes. In 1949, when the FDR Drive was widened, a portion of the park between Montgomery and Jackson Streets was eliminated. South Street was extended in 1963, protruding onto another 30-foot section of the park. In 1951, Parks built the 10th Street pedestrian overpass above the FDR Drive, connecting the park with East Village residents, and with residents of the neighboring Lillian Wald Houses. For almost two decades, the park has been the site of extensive renovations to various parts of the park. In the 1990’s, Parks opened the 10th Street comfort station and began improvements to the aging seawall. More recently, Parks did a partial reconstruction of the Fire House, reconstructed four ball fields and continues to do major work on the bulkhead and seawall – structures which were built in the 1930’s and now in need of reconstruction. Just completed in 2010 is a new promenade that extends to Grand Street, offering views of the river where the sea-faring city first took root.